I have all the Isca films. I've done tons of research for many people whose ancestors are from Isca. Matter fact I just finished research for a gentleman whose ancestors are Vivino. My own ancestors are from Isca too! Tell me the who your ancestors are from Isca and if you have birth years for them. I can do a look up for you the next time I go to the Family History Center. How is Giuseppe Procopio related to you? I am really not sure if the information you provided is what I am looking for. I know that Giuseppe Procopio emigrated to the United States with his brother Vincenzo. Vincenzo returned back to Isca, but Giiuseppe stayed in the US. They never saw each other again. Vincenzo was my great grandfether. My father promised him that some day, he will find Giuseppe Procopio. My father tried but was never able to find him. Giuseppe Procoio died in the 70's. My father has a photo of Giuseppe Procoio with a newborn baby in February 1960. A lot of people from Isca Sullo Ionio settled in Northumberland County, Pennsylvania. In such towns as Shamokin, Mount Carmel, Marion Heights, etc. This is the Coal Mine Region! You'll find tons of Procopio's there. The next place they stayed was in Philadelphia, Pennsylvania. Since he was your great-grandfather's brother, then do you know the name of their father? Do you know the birth date of your great-grandfather? Knowing this information could help us find Giuseppe in the US Census and a ship's manifest. Plus too this information could help me find his birth act from the Isca films. I have tons of Procopio's in my family. There are Mirarchi, Procopio, Coroniti, LaCroce, Guarna, Varano, Nestico, etc. Please let us know what you have on your great-grandfather and that information will help us find his brother. After further resaerch, I have found out that Giuseppe Procopio emigrated to the United States at the age of no older than 20 years old. Also, his father's name was Andrea and mother's name was Rosina. With this new information know, how can I get in contact with damily members. This is a possible Social Security Death Index for Giuseppe. I have not been to the FHC due to a health issue, but I will be there shortly to look up the birth record in Isca Sullo Ionio for you. The added information you gave will be a big help! Is there another death record in pensylvama or New jersy for Fiuseppe procopio sometime after 1973. because I know for a fact that He was a live in 1972. Found this one in NJ. Also found one under Joseph. I don't know about Joseph Procopio. I mean on his birth certificate, it must be written Giuseppe Proopio because he was born in Isca. I don't think his death certifiate would have Joseph. However, the record with Giuseppe Procopio sounds good. Can you tell me what year this peron arrived in the United States. Do you have access to marriage certificates. Wow, I was surprised to find this thread. I am from Kulpmont and my family's last name is Ortona. Anyone have any info on them? I'm pretty sure the first names were Antonio and Concetta. Thanks. Am interested in gathering information on the Mascitelli family from Rapino. Am especially interested in Rachele Mascitelli, who was married to Cristoforo Ferrante. I do not have their dates of birth. Cristoforo was deceased by 1895, but Rachele was apparently still living. In addition, I'm looking for information on Rubina Mascitelli. She was married to Pantaleone Parente (b 1855). Two daughters from this family married two sons of Michele Ferrante (b. 1850) and Angelica Di Tullio. Wd appreciate any information you might have. Many thanks. 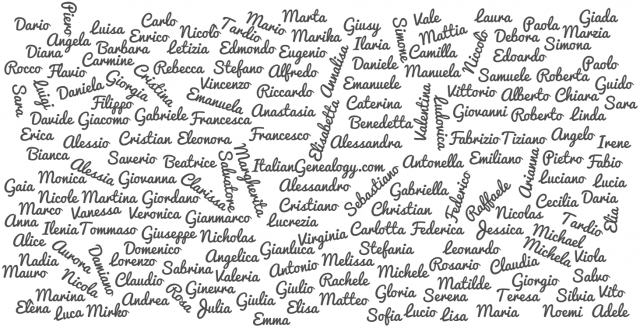 Hi, I just joined Italian Geneology and am trying to track down some family from Isca Sullo Ionio. My great grandfather was Guiseppe Procopio born Sept 14, 1887 in Isca Sullo Ionio. He married Concetta Mirarchi also from Isca. He came to US through Ellis Island at least 2x. The first time he was single and when arrived at Ellis had an eye or ear infection (Can you confirm which?) and was turned away and sent back to Italy. He came back again, this time married (but Concetta did not come yet) and according to 1930 Mt Carmel, PA census records (lists him as Joseph Precopio-misspelled), his immigration was in 1911. Cross referencing, Guiseppe Procopio (born in 1887) arrived at Ellis Mar 16, 1911 on the Konigin Luise out of Naples at age 24y. (Passenger records state his last residence as Gasperina, Catausdro. His wife Concetta Mirarchi immigrated in 1912 according to that 1930 US Census record. She was also born in 1887 but I can’t find Ellis Isl records for her. Do you know parents of either of these two? Brothers and sisters? Birthdate and immigration records for Concetta (Mirarchi) Procopio? Death records for them In US? As of right now, I most need to find out when Guiseppe Procopio, Sept 14, 1887, arrived at Ellis 1st time (1905, 1907, 1909?) and for what medical reason was he turned away? And was this Mar 16, 1911 Ellis record I listed him? I started this only 3 days ago for a grade school project for my daughter. Info is contradictory among my family, and I am down to my last day Wed, Mar 28. I only found Italian Geneology site last night. Any info you can provide today would be awesome. The project is Ellis Island, and we are supposed to tell about how my great grandfather was turned away at Ellis for medical reason and was shipped back to Italy, and had to wait and save to come back to America again. So this is what I most need, dates/years he came into Ellis, and medical problem. Thank you so much. I had no idea a little project could snowball into something so huge and confusing! Hope you can help, Alicia Procopio-Starrett. My Great Grandfather was Guiseppe (Joseph) Procopio, my Grandfather Belmont Procopio, my Dad is Charles Procopio. They all live in Mt Carmel, PA. If you want to know great grandparents contact Aunt Mary. She would be glad to clue you in.